So many of the comments I receive when I'm talking about card making or scrapbooking are "I just don't have the time!". Believe me I understand. It's hard to fit it all in. That's where Close To My Heart's Card Kits come in. 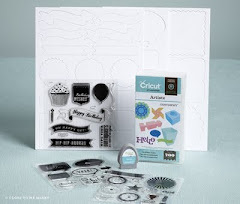 These nifty card kits are SO easy to put together - and there's no stamping involved! The featured card kit in the Autumn/Winter Idea Book (page 88) is the Festive Memories Card Kit. This kit is for photo cards, which I personally LOVE! I almost always include some type of photo of my daughter or our family in my Christmas cards and this kit will make it that much easier. You simply print your 4"x6" photos and adhere them to the inside of the top of the cards. Tip: Add your photos to the cards FIRST. Then fold the cards in half and add the stickers and self-adhesive gems. That way you can see your photo image through the "frame" and you won't cover up any essential parts of the photo with stickers. 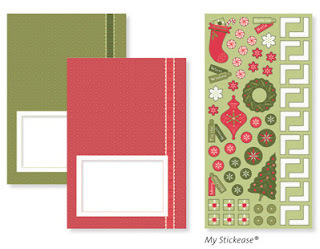 The Festive Memories Card Kit kit includes the supplies to make 12 cards and includes the envelopes!